* Courses can also be arranged on dates to suit your needs, fill in the booking form with your preferred dates and Alasdair will be in touch to confirm availability. Make your own unique and individual piece of furniture from scratch. 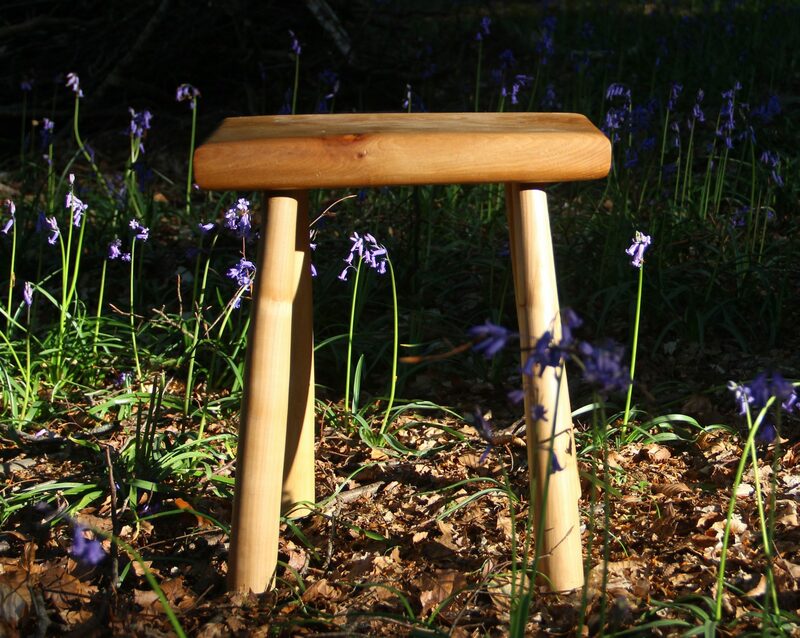 These courses allow you to get creative and under Alasdair’s close guidance make your own table or stool. 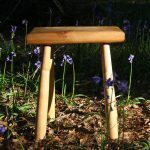 Choose from a range of seasoned hard wood tops or seats all from the surrounding native woodland, then shape, carve and finish them using traditional green wood tools and techniques. 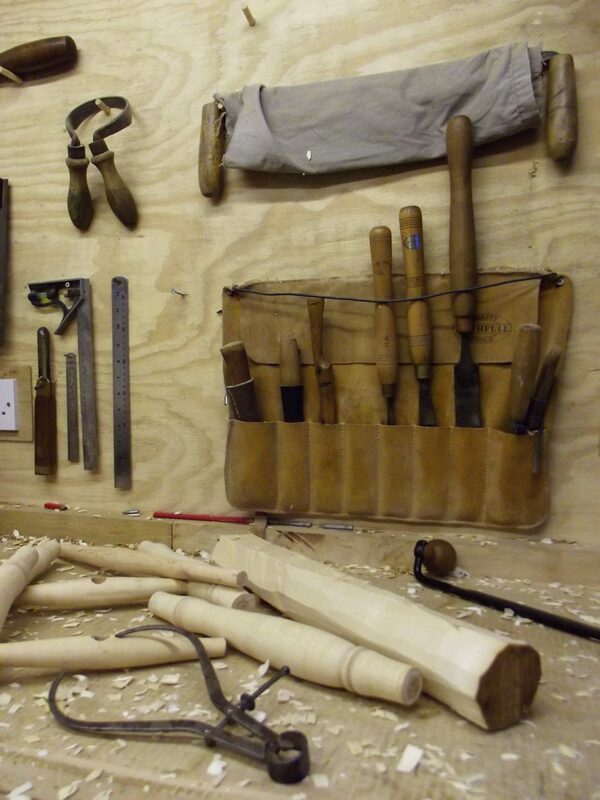 Complement this with green wood legs (and stretchers for those on the three day course) which will be cleft from a freshly cut log and shaped using side axe, drawknife and pole lathe. The fundamental techniques of green wood working will all be covered in depth allowing you to produce the components for your furniture. 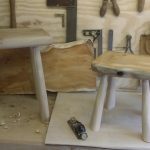 The later section of the course will delve into the details and methods of using round mortice and tenon joints secured with oak wedges to complete your table or stool. The detail of marking out, setting the angles and producing secure long lasting joints will all be covered, setting you up to move on to more complex pieces and expand your knowledge. You will be responsible for the basic design, size and layout of your piece. Examples of Alasdair’s previous work will be on hand for guidance and inspiration. It is then up to you to work with the green wood to achieve the feel and character you desire. 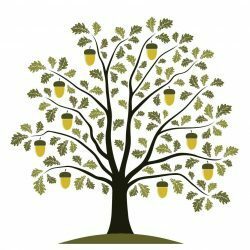 The emphasis is on allowing the natural characteristics of the material to shine through, and to control how the natural material influences the finished article: this is the very nature of green woodworking. Starting from first principles no experience is necessary although be aware that the work can be quite physical. It is advisable but by no means necessary that the two day course be completed before signing up to the three day course. I like to start the longer course by selecting and felling a tree from the nearby woodland, this gives us a chance to discuss some of the issues surrounding our native woodland and its care, note that all courses will include a guided woodland walk even if we have no need to fell a tree specifically for the course. 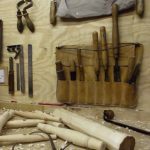 The three main elements of green woodworking will be used in depth, chopping block for cleaving and shaping with a side axe; shaving horse and pole lathe. 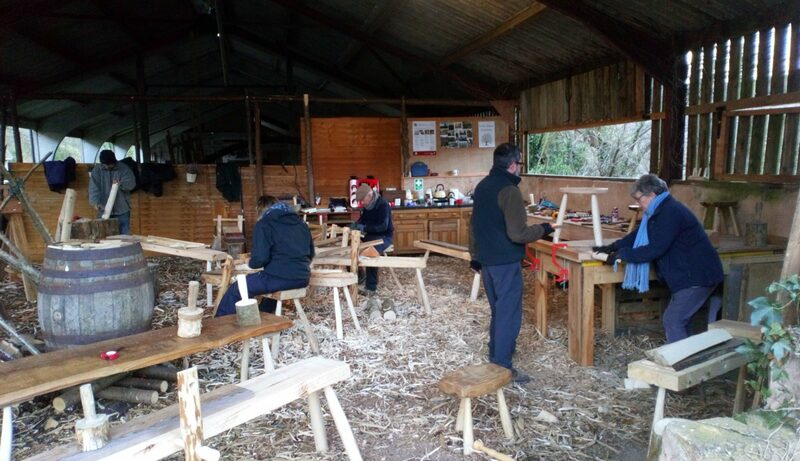 Unlike the dedicated pole lathing courses it will be important to understand that the components must ultimately come together into one complete piece and this will influence the entire process from timber selection to final jointing. 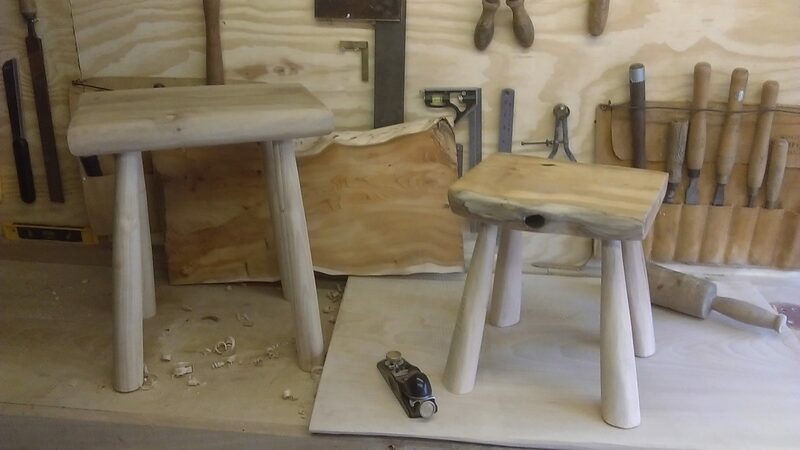 You will after this course have a deep understanding of the methods and principles of the green wood craft and most importantly how they can be applied to produce a piece of furniture. In addition to this you will leave with your very own hand made item, I still have my first one in fact you will see it if you attend a course. You can pay online or make an enquiry via our booking form or, alternatively, simply contact me directly. Children under 16 accompanied by an adult are half price. An exclusive family booking (2 adults and up to 3 children) is £240 per day. 10% Discount for bookings of four or more. One-to-one courses are available at the full rate only. 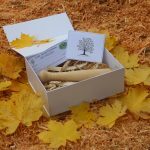 Little Acorn Gift boxes include a hand turned gift of your choice, an “about bodgers” card, left blank for your own message and an optional voucher for one of our green woodworking courses. All presented in a beautiful gift box decorated with our tree logo. Is this course available on other dates? If these dates don’t suit you or you would like to book both courses consecutively why not contact Alasdair directly to arrange a time that suits you. However big or small your group we will be able to provide a course that suits your needs. Please place your enquiry as soon as possible to ensure we can arrange dates that suit you.